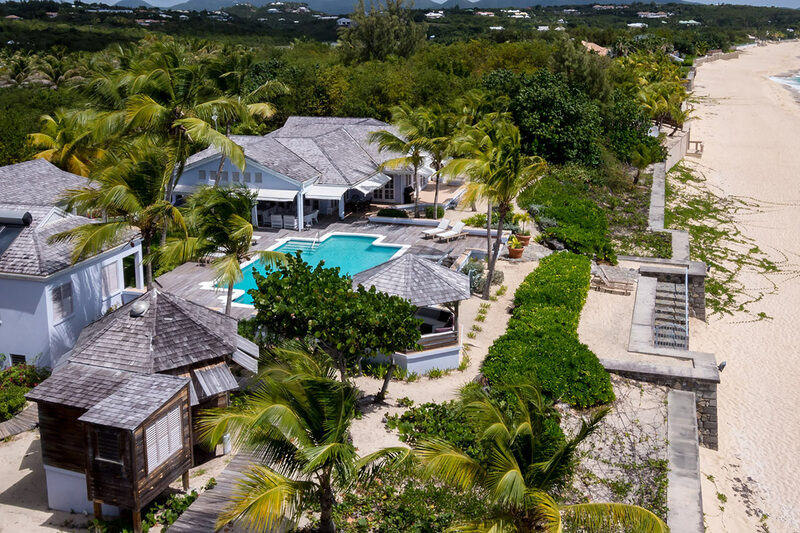 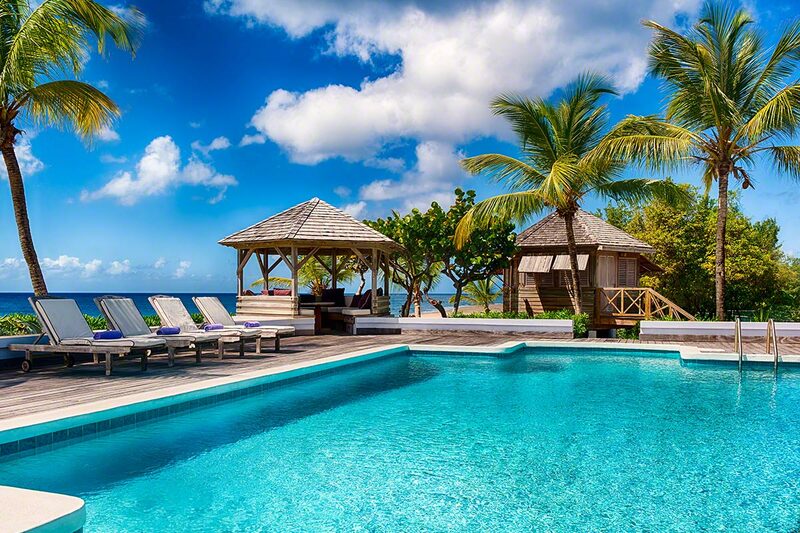 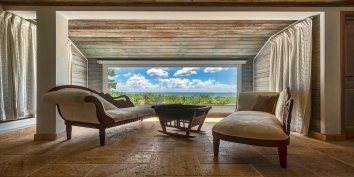 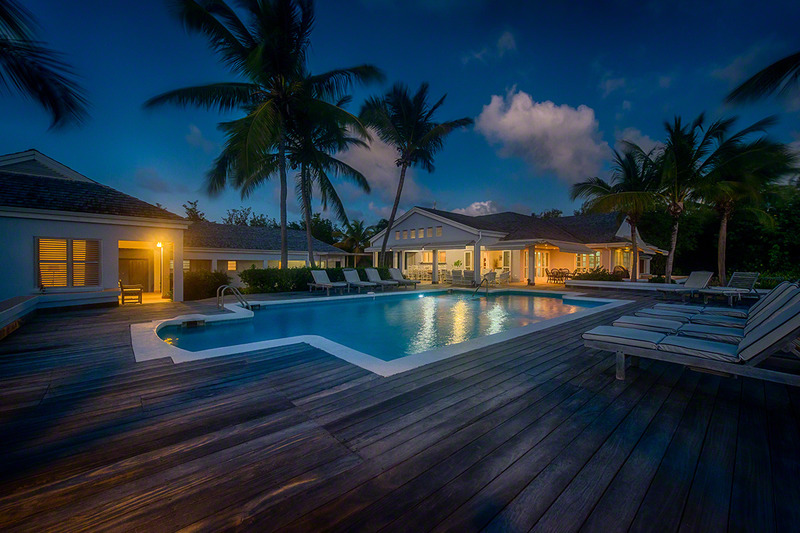 A gorgeous Caribbean beachfront villa with 5 bedrooms, large heated swimming pool and gorgeous sea views! 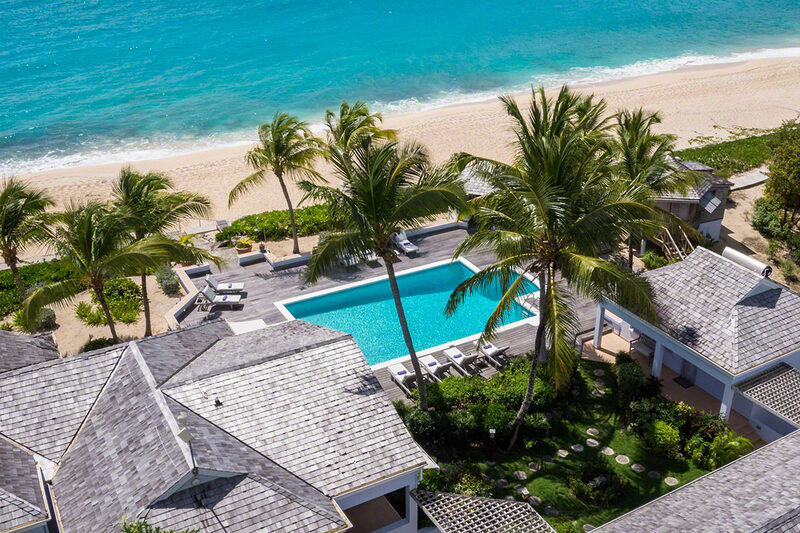 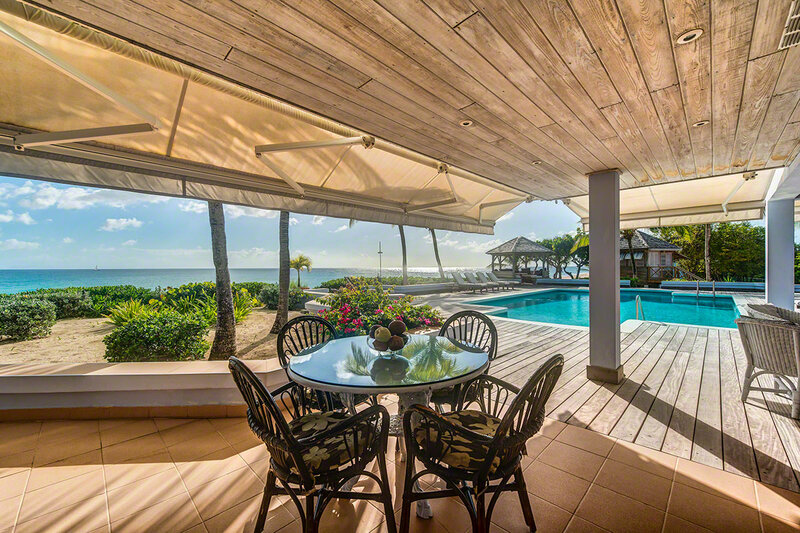 Eden is an expansive beachfront estate and perfect for a Caribbean holiday, making it one of our most popular Saint Martin villa rentals. 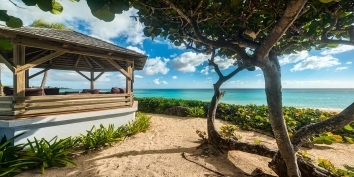 Situated along the shores of beautiful Baie Longue Beach, known for its white sands and reef-protected Caribbean Sea. Eden is a very spacious vacation home with amenities making it feel like a private resort. 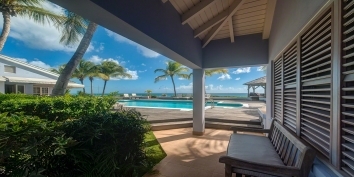 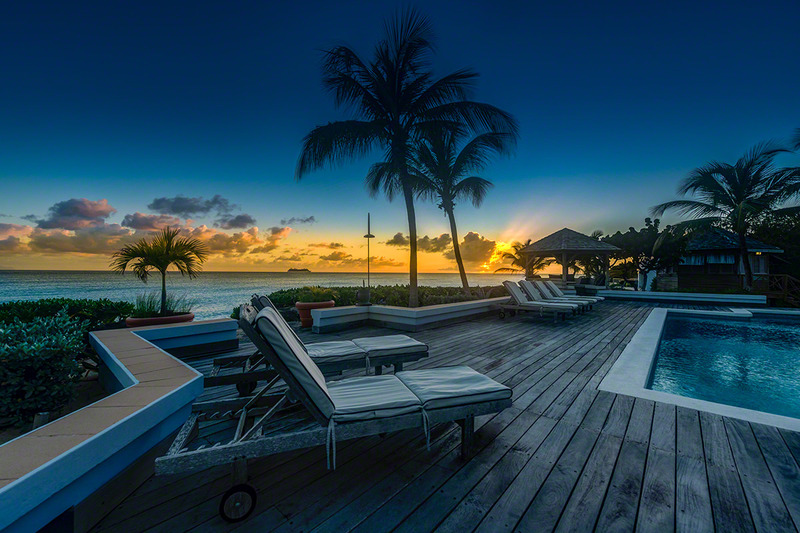 This beachfront villa has a total of 5 (4+1) bedrooms, each with private bathrooms and can be rented as a 4 or 5 (4+1) bedroom St. Martin villa rental. 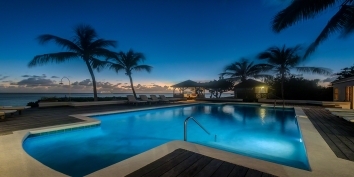 Eden has beautifully landscaped tropical gardens with towering coconut palm trees. 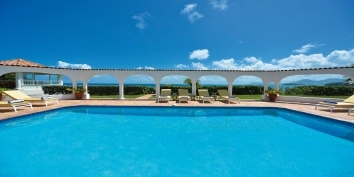 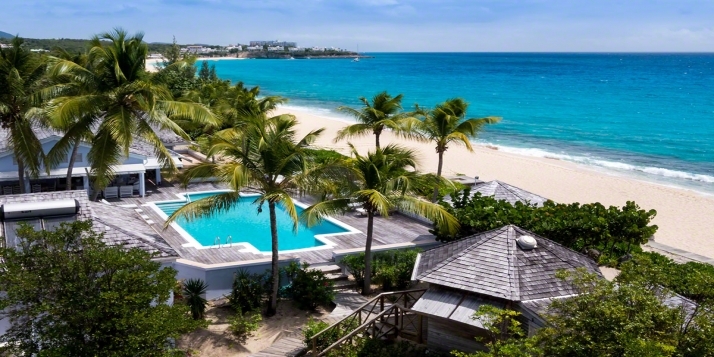 The large swimming pool is perfect for cooling off on warm days during your vacation in Saint Martin. 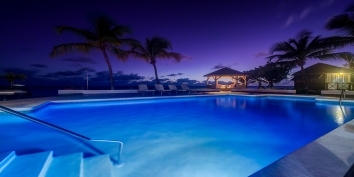 The swimming pool is surrounded by a spacious pool deck with cushioned lounge chairs and views of the Caribbean Sea. 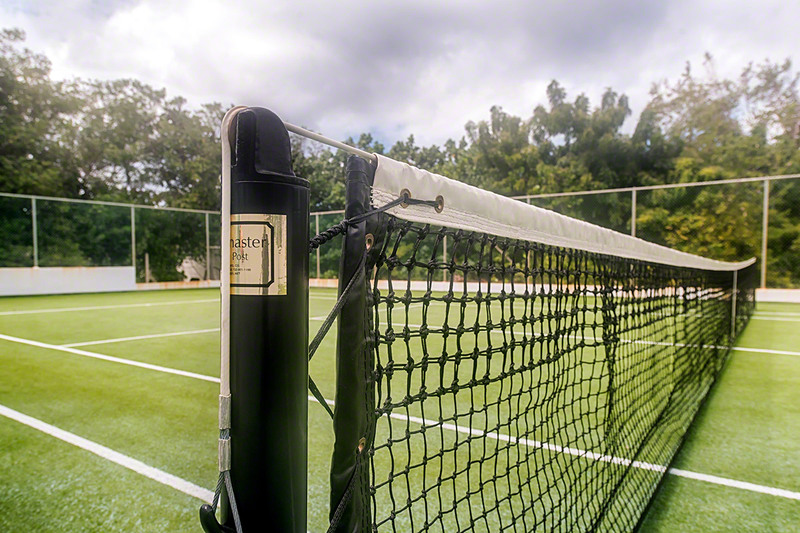 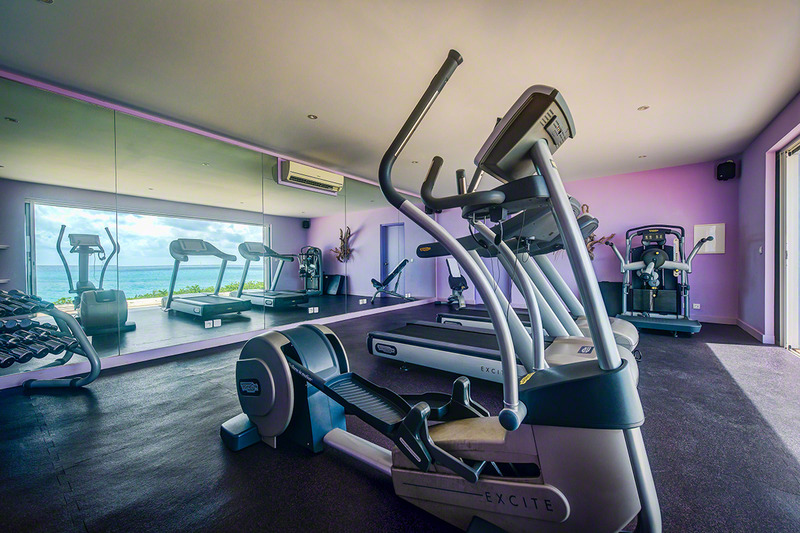 Eden has a private tennis court on site as well as an air-conditioned fitness room, so you’ll have plenty of opportunities to keep up your exercise regime. 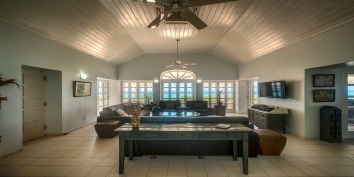 Inside this Caribbean villa rental, the air-conditioned living areas boast high ceilings and modern furnishings in natural tones and there are plenty of cushy seating areas for relaxing. 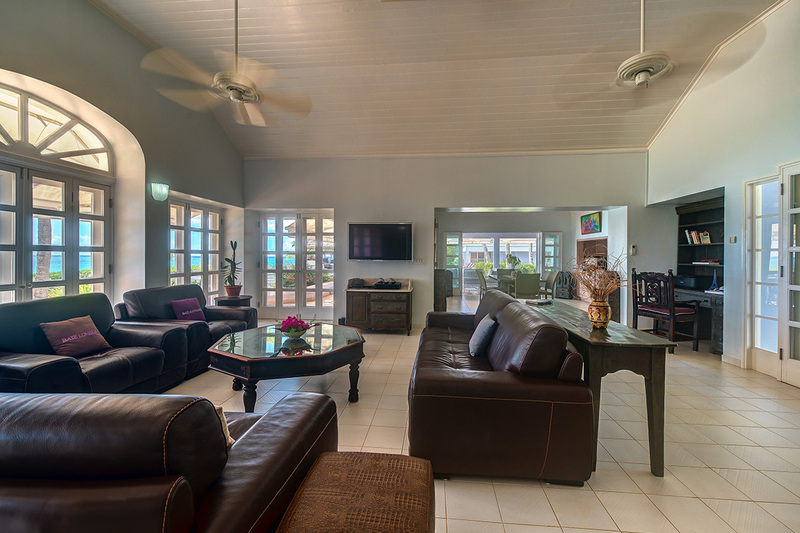 The spacious kitchen comes fully equipped with everything you may need during your Saint Martin holiday. 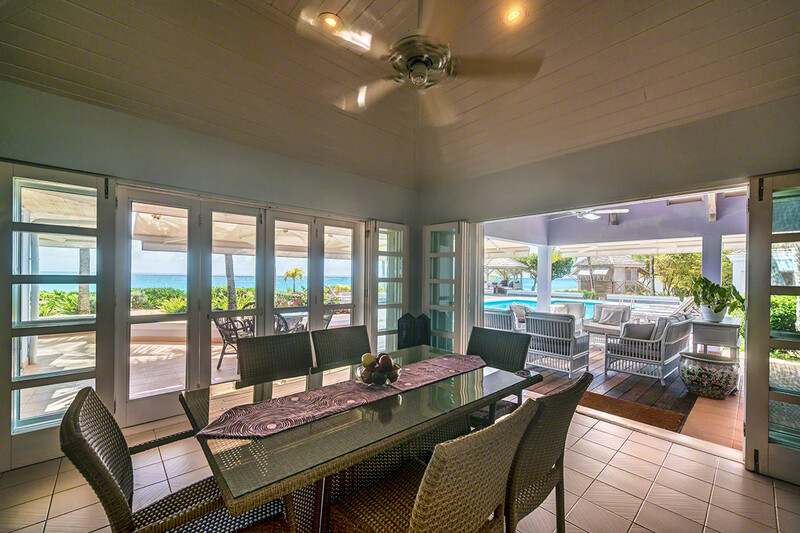 There is a a formal dining room near the kitchen, but be sure to take advantage of the BBQ and alfresco dining areas on the covered terrace for a casual vacation dining outdoors. 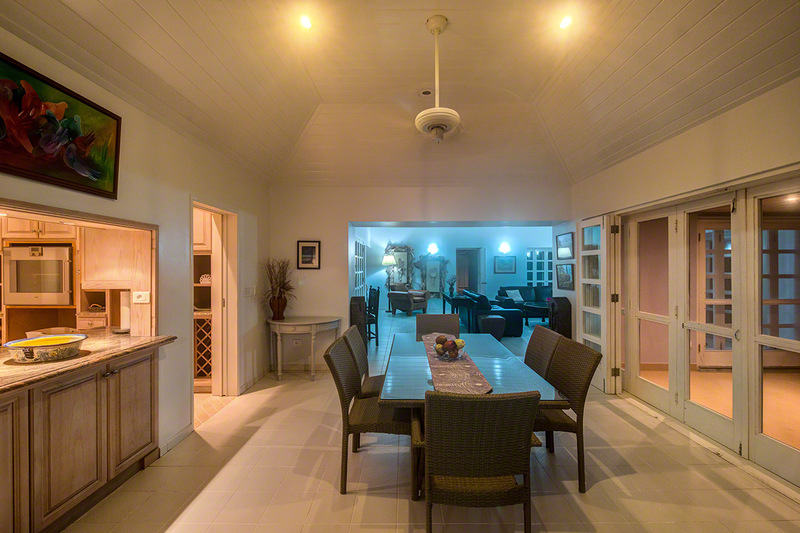 Wi-Fi in the home ensures that you’ll stay connected if you (really) need to get some work done. 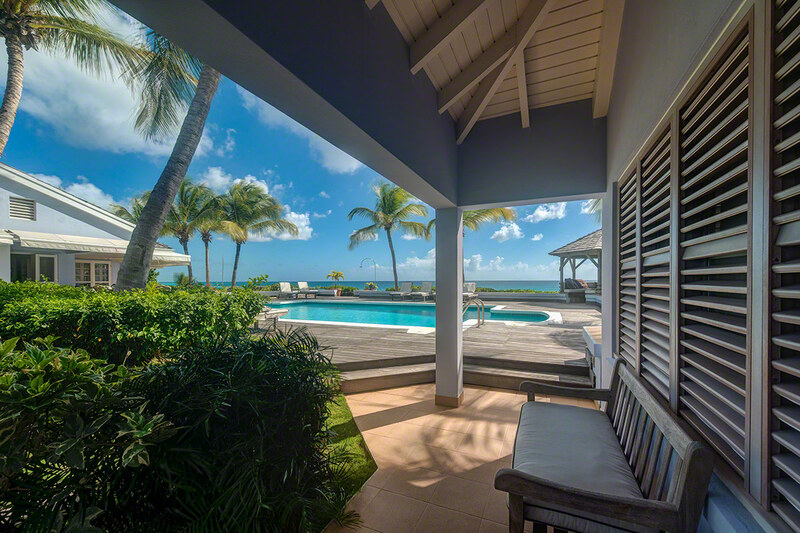 Up to 10 guests can be comfortably accommodated in the five bedrooms of this Saint Martin villa rental. 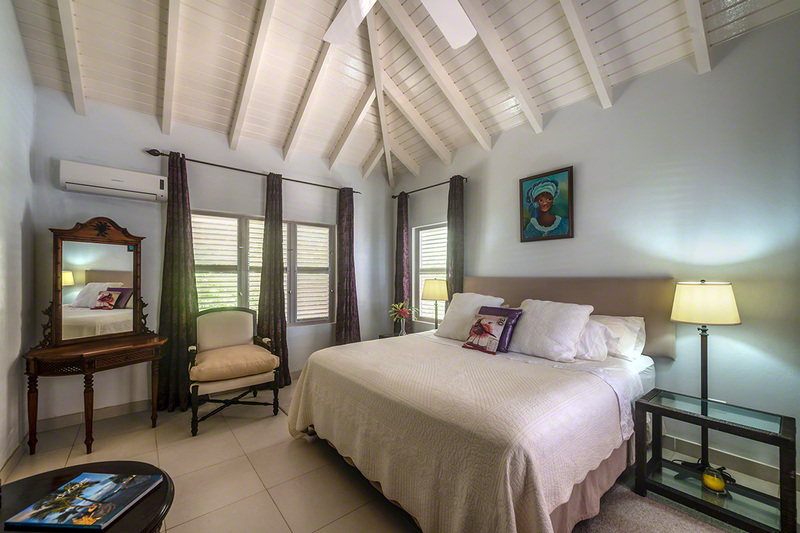 Every bedroom at villa Eden features air-conditioning and a private, en-suite bathroom with shower. 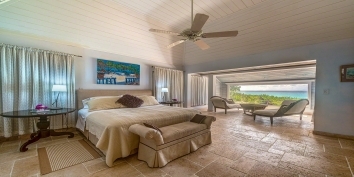 The master bedroom suite boasts a king-sized bed, TV and a telephone, and there are three further bedrooms with king-sized beds. 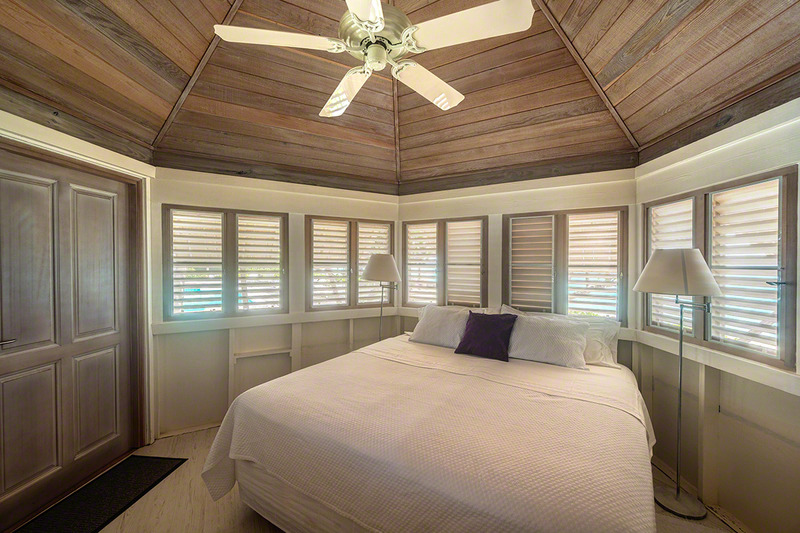 The fifth bedroom features two twins, which can be put together to form a king-sized bed. 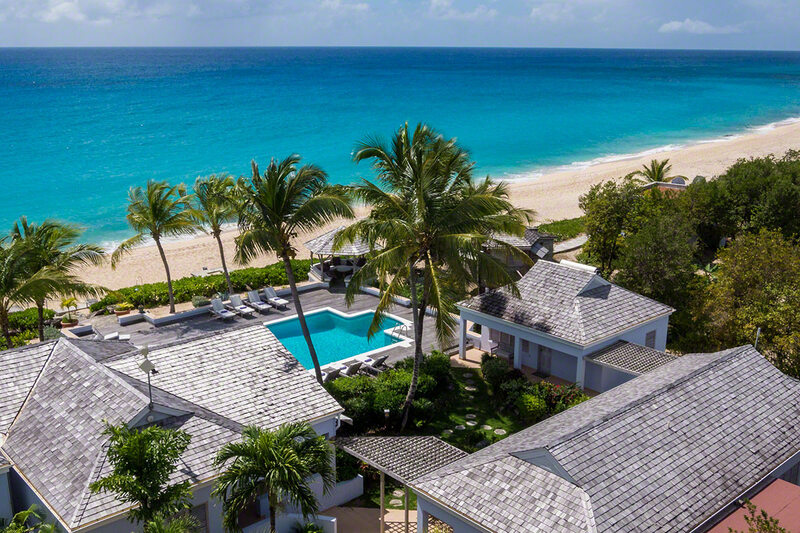 This Saint Martin holiday villa is just 15 minutes away from the airport, and only 10 to the nearest grocery store and restaurants. 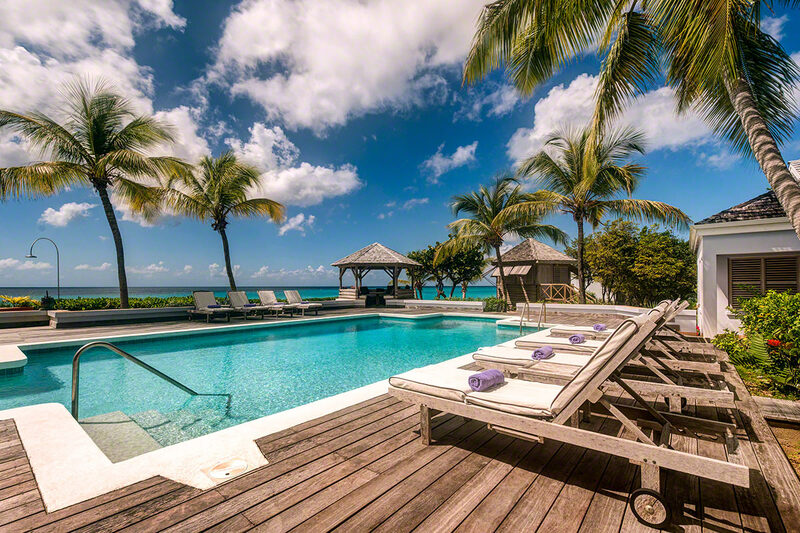 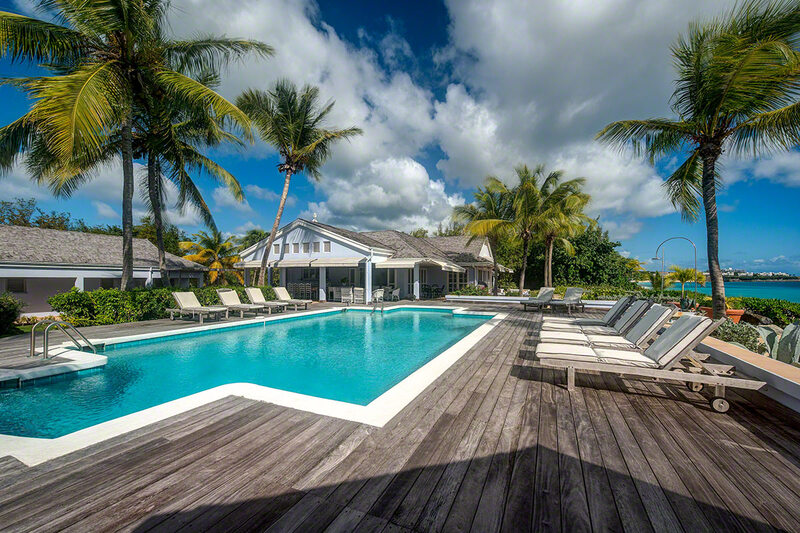 Perhaps the best feature of all is the Eden villa’s direct access to Baie Longue Beach, which is perfect for sun lounging, walking, swimming and snorkelling. 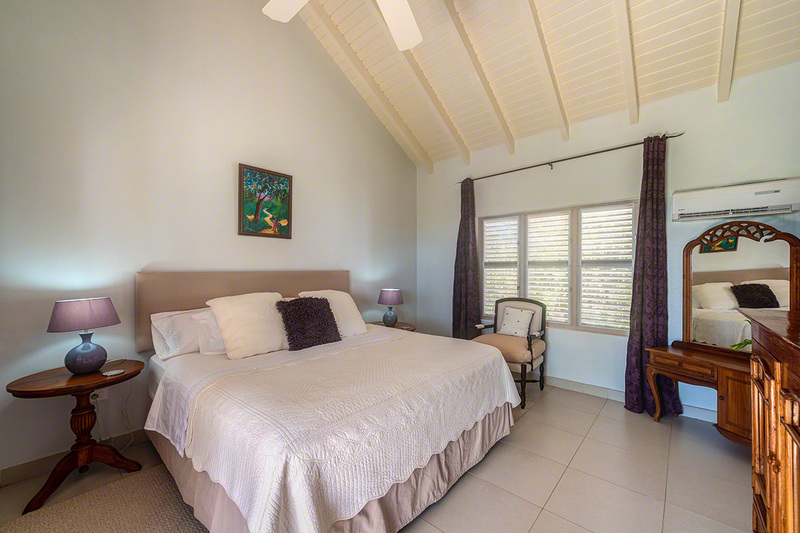 The master bedroom and the three main bedrooms feature king size beds, air conditioning, TV, ensuite private bathrooms with showers. The master bedroom connects to the living area. 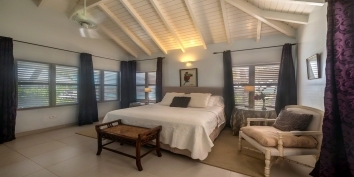 The fifth smaller bedroom (+1 Bedroom) has twin beds which can be made to a king size bed, air conditioning, TV and has its own ensuite private bathroom with shower. This bedroom is located in a very charming tropical wooden bungalow, just a few steps away from the pool and beach. 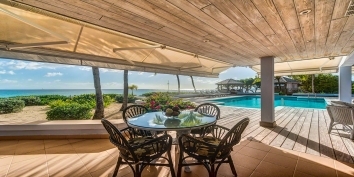 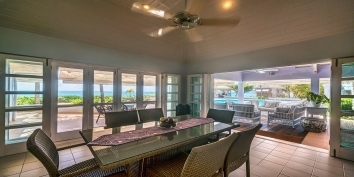 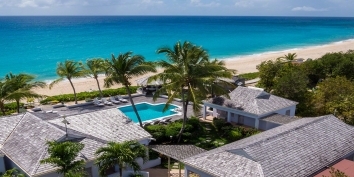 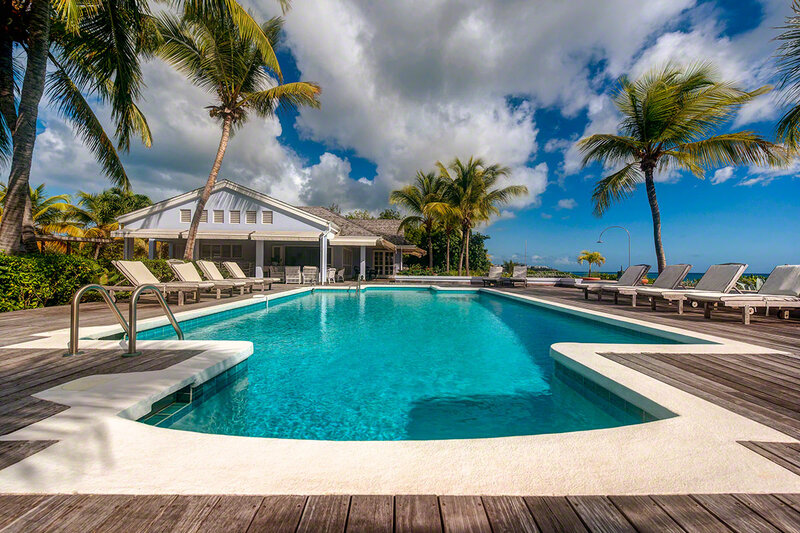 This Saint Martin vacation rental can be rented as a 4 or 5 (4+1) bedroom villa! Air Conditioned, TV, DVD, CD player and ceiling fan. 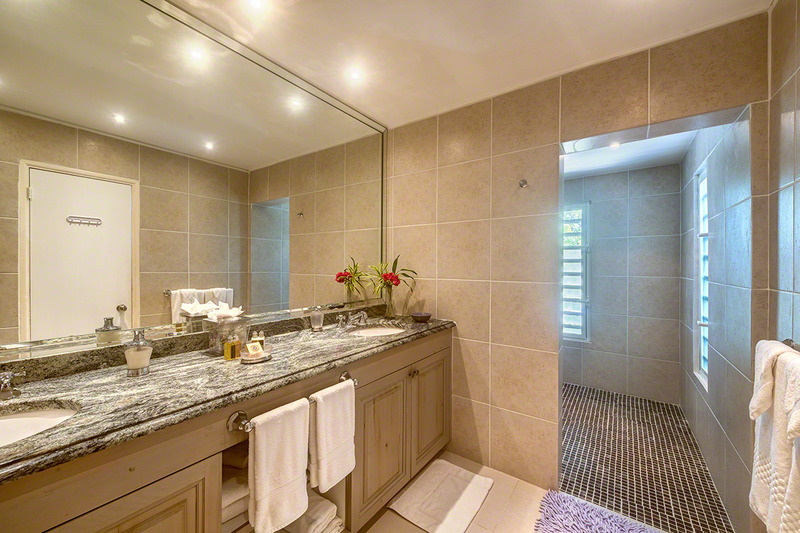 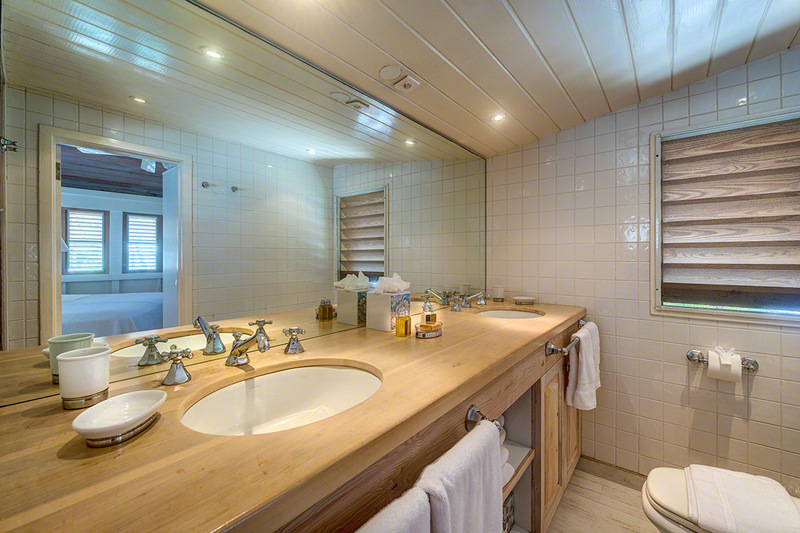 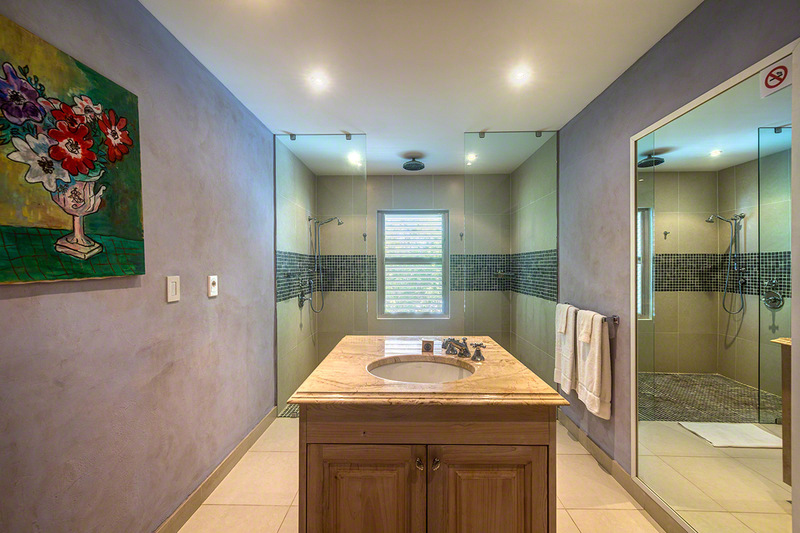 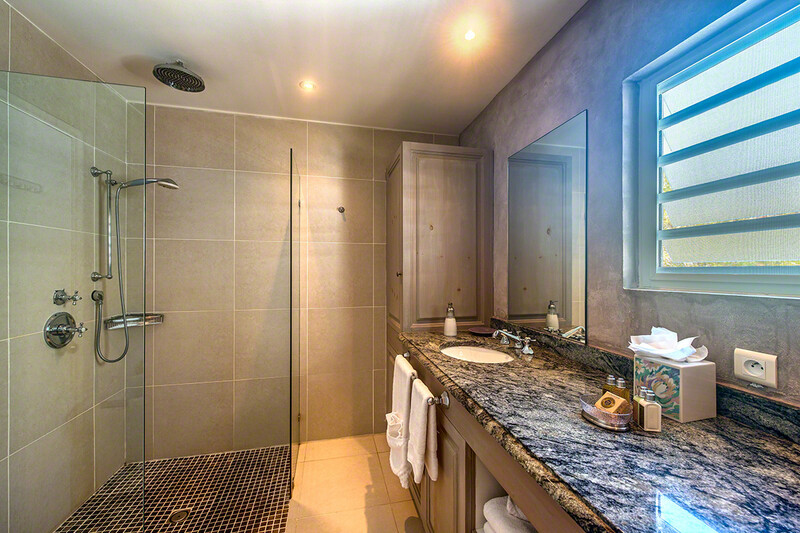 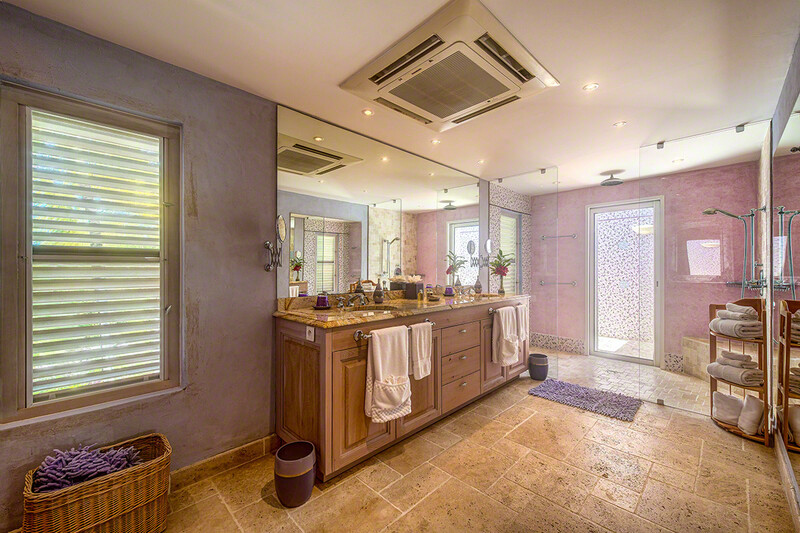 En-suite private bathrooms with showers and hairdryer. 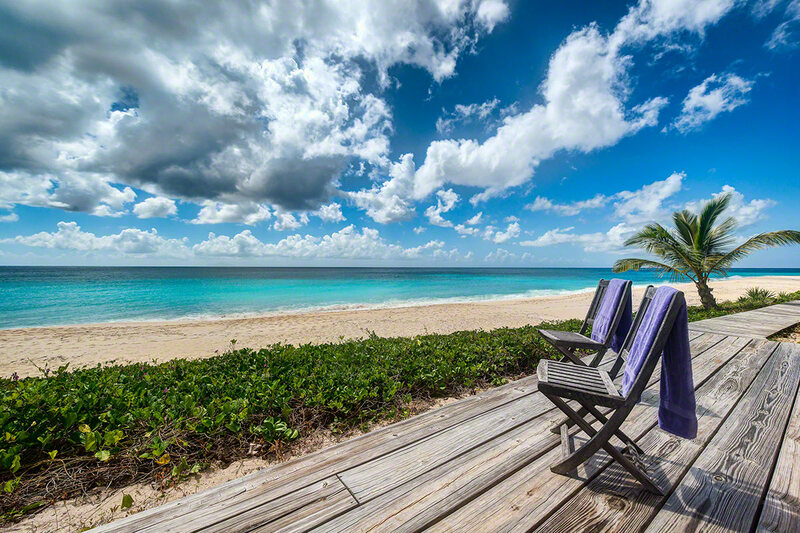 To Beach: Out the door. Google Map showing the approximate location of villa Eden, Baie Longue Beach, Saint Martin.